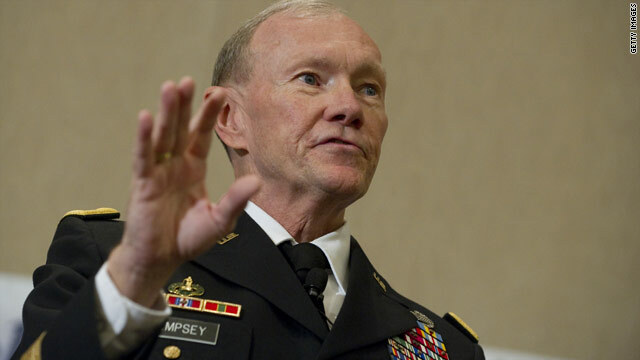 Gen. Martin Dempsey fought in the first Gulf War and returned to Iraq as commander of the 1st Armored Division. Washington (CNN) -- The man President Obama nominated Monday to be the next chairman of the Joint Chiefs of Staff has years of experience fighting two different wars in Iraq, but little experience in Afghanistan. Gen. Martin Dempsey, became the new Army chief of staff just last month but he's is already in line for the only higher-ranking job available to someone in uniform: the president's top military adviser. It's the culmination of a career in the U.S. Army that began when he attended the United States Military Academy at West Point, New York, in the waning years of the Vietnam War. Dempsey was born in Bayonne, New Jersey, but attended high school in Goshen, New York, in the shadows of West Point. He says he's a fan of the New York Yankees and Frank Sinatra. Dempsey graduated from the academy in 1974 as an armor officer, and was soon assigned to a tank unit in Germany followed by a helicopter reconnaissance unit at Fort Carson, Colorado. From Colorado he went back to school, earning a master's in English and then returned to West Point as a professor in the English Department. By 1991, then-Lt. Col. Dempsey was back serving with a tank unit as executive officer of the 3rd Brigade of the 3rd Armored Division, helping to head that unit into Iraq as one of the lead elements in the invasion of Iraq during Operation Desert Storm. Between Desert Storm and Operation Iraqi Freedom, Dempsey climbed the Army chain of command. By then armed with three master's degrees he eventually rose to the position of special assistant to the chairman of the Joint Chiefs of Staff. By September 2001, Dempsey had risen to brigadier general and traveled back to the re-ignited Middle East as an adviser to the Saudi Arabian military. In June 2003, just a few months after the U.S. invaded Iraq again, Dempsey assumed command of the 1st Armored Division in Baghdad. He would stay there for 14 months. A year later, he was back in Iraq for a two-year tour overseeing the training and equipping of Iraqi Security Forces. After leaving Iraq, he became deputy commander of U.S. Central Command, which oversees both the Iraq war and the war in Afghanistan. He later served as acting commander of CentCom before earning his fourth star and taking the job of commander of U.S. Army Training and Doctrine Command. On April 11, 2011 when he assumed the role of chief of staff, he noted that the date was an ignominious date in military history, being the day that Napoleon abdicated the French throne and President Harry Truman fired Gen. Douglas MacArthur. "I am hoping that I can turn the tide on this April 11 thing," Dempsey told the crowd. But turning serious, he told the gathered soldiers and veterans, "My commitment and expectation to this great Army is that we will work on strengthening the bond of trust among those with whom we work, among whom we support and among those who march with us into battle." He summed up with a quote from Benjamin Franklin: "Well done is better than well said." The crowd that day included his high school sweetheart turned wife, Deanie. They have three children, all of whom have served in the Army, and three grandchildren. And his daughter Megan and her husband Kory are expecting twins this summer. If you see Gen. Dempsey and he's smiling, it could be because he stands to assume the highest military position in the country. Or it could mean he's thinking about two more grandchildren in the family.